Here at Buy Owner, we have given you tips on staging your home for the summer. But what about the backyard? Chances are that potential buyers will want to spend a lot of time outdoors if you have a patio, a lanai or a swimming pool. So why not make the space fun and inviting? •	Create the same feeling you would inside the living room; comfy outdoor furniture is a must. •	A dining area, with a table and chairs, is essential if you want to entertain outside. •	If you lanai is enclosed, potted plants will seamlessly connect this indoor space with the rest of the foliage in the backyard. •	If your patio is open, plant a garden nearby to catch the eye. •	Offer open house visitors some fruits or veggies from a tray you place on the patio table. However, if the patio is unscreened, completely outdoors, do not leave the tray outside and unattended where bugs and animals can get at the food. •	Set up the Wi-Fi capabilities to extend to the outdoor perimeter of your property. •	Check out this Buy Owner Blog post on swimming pool accessories! 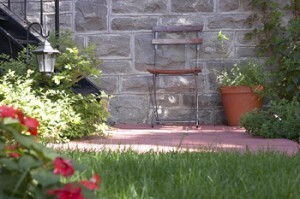 •	Consider adding a cement or brick paver patio. •	Create a small sitting area with all-weather whicker or wood furniture. Give the buyers something to do with the space. You can even offer to sell the brand-new patio furniture. •	If the lawn is bare, add foliage! You cannot expect trees to grow tall over night. Adding bushes and flowers is a start. •	Aluminum or wood sheds are great places to store equipment to maintain the pool or the landscaping. •	Create a “workout space,” complete with basketball hoop, a mini trampoline and plenty of room to lift free weights or do yoga. •	Build a fire pit, a custom bar or a niche for an outdoor grill.